The Stimson-Green House is a beautifully-preserved example of a fashionable turn-of-the-century Seattle home. Its first owner, Charles Stimson, moved to Seattle in 1889 and rapidly developed profitable timbering and real estate businesses in the nearby community of Ballard. He was also director of the Metropolitan Building Company, the Metropolitan Bank and the General Insurance Company of America as well as the Alaska-Yukon-Pacific Exposition of 1909. By 1899 he had acquired enough prestige and fortune to commission construction of a three-story house on First Hill, a neighborhood northeast of downtown characterized by substantial homes and well-shaded sidewalks. 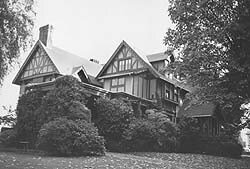 Its exterior illustrates many elements of the then-popular Tudor Revival style: steeply pitched roofs, decorative half-timbering, casement windows with diamond-shaped leaded panes and elaborate chimneys. The elegant interior included paneled wainscoting, a dining room frieze, and a library fireplace surround that featured a pair of hand-carved lions. In 1914, Stimson decided to live in The Highlands, an exclusive, new development he was sponsoring near Lake Washington, so he sold the house to Joshua Green. Green had moved to the Pacific Northwest about the same time as Stimson, founding a steamship company that made him similarly wealthy. His investments later expanded to insurance, transportation, and finance. Instead of following through on his plans to retire in 1926, he purchased the small, failing People's Savings Bank. In 10 years he turned it into a national bank titled People's National Bank of Washington, which is now one of the largest in the state. He also became known as a sportsman and a philanthropist, and a mountain and river in Alaska are named for him. His influence extended so widely that in 1968 Seattle named Green its "man of the century." He lived in the house until his death at 105, having rarely altered the building and preserving many of its early furnishings. One of the few surviving substantial First Hill homes to have survived in its original form, the Stimson-Green House today provides the rare opportunity to visit residential life in early 20th-century Seattle. The Stimson-Green House is located at 1204 Minor Ave. It is occasionally open for tours and receptions. For more information call 206-624-0474 or visit the mansion's website.